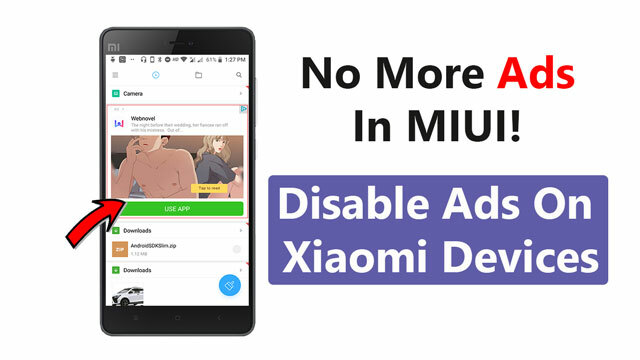 Today in this article we have come with the guide on How To Disable Ads On Xiaomi Devices, first of all ads are becoming very annoying on xiaomi devices. It’s showing up on System Apps, Settings which is not expected, Apps like Browser, Video, Music Player all of these apps already show ads on xiaomi devices. Once you have done just open Default MIUI Browser you will see there are No Ads Now! This is because we want to use PlayStore when it comes to India Google Play Store is available. So, everyone uses Google Play store to update apps rather than using any other application. Once you have done just open Mi Store you will see there are No Ads Now! Once you have done just open MIUI Music Player you will see there are No Ads Now! Once you have done just open Mi Video Player & MIUI Security App you will see there are No Ads Now! Now if you are seeing ads on other than these apps then you just have to do only one thing that’s is Just Go To Settings & Disable Recommendations. As might have already seen on your xiaomi devices that when you click on more apps folder it will show up these extra apps which are promoted apps. Now how to disable that just follow the steps. Note: If revocation fails then try rebooting your device & try again. Or else sign into Mi Accounts & Tyr Again. Once you have followed all these steps successfully then you will not see any ads on your xiaomi devices. Now your xiaomi device is ad-free and most probably no ads should be shown in those system applications and that’s it 🙂 You Have Successfully Disable Ads On Xiaomi Devices. Final Words: So, that’s the easiest way to Disable Ads On Xiaomi Devices. I hope you find this article helpful, If yes then make sure to share this post so, that it can help other users as well. If you want to ask any questions related to Disabling Ads On Xiaomi Devices then make sure to comment down below. We would love to hear from you!